In 1960, Senator Barry Goldwater's Conscience of a Conservative appeared. Forty-seven years later, economics professor and New York Times columnist Paul Krugman, soon to be Nobel prize winner, had a book published with a similar title. 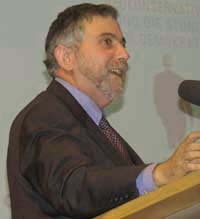 In Conscious of a Liberal, Krugman describes a long Gilded Age as lasting from the 1870s to the Great Depression around 1930. He writes that it was a time of "vast inequality in wealth and power, in which a nominally democratic political system failed to represent the economic interests of the majority." He describes with some detail a "wealthy elite" dominating the political life of the country. The power of the state was used to protect property interests, and there had been an "uncritical acceptance of a conservative ideology that warned that any attempt to help the less fortunate would lead to economic disaster." He describes income distribution for the 1920s, excluding capital gains, as follows: the highest ten percent in income was receiving 43.6 percent of the total income; the highest one percent in income was receiving 17.3 percent. He indicates that the income distribution figures for 2005 were similar: 44.3 percent for the highest ten percent in income, and 17.4 percent for the highest one percent. Krugman writes that the Great Depression smashed the Gilded Age. He writes of the reforms of President Franklin Roosevelt taking away much from the wealthy. The richest 0.1 percent "owned more than 20 percent of the nation's wealth in 1929 but only around 10 percent in the mid-1950s." Krugman writes that "Basically the New Deal taxed away much, perhaps most, of their income." He adds that blue collar workers – above all, industrial workers – were the biggest beneficiaries." He describes the mid-1940s to the mid-seventies, as a "golden age of manual labor." The new distribution of wealth (called by Krugman and some others The Great Compression) far from destroying prosperity, "seems if anything to have invigorated the economy." With World War II came a "great boom in wages" that "lifted tens of million of Americans ...from urban slums and rural poverty to a life of home ownership and unprecedented comfort." With Roosevelt's policies in place, a postwar middle-class society arose "in just a few years." It was, says Krugman, politics taking the lead rather than the "impersonal economic forces" that those hostile to Roosevelt preferred. President Eisenhower was a Republican who accepted Roosevelt's New Deal, but during his presidency there were Republicans who resented Eisenhower's liberalism. Writes Krugman: "Even as Dwight Eisenhower was preaching the virtues of a toned-down 'modern' Republicanism, a new kind of conservative was beginning to emerge... They saw themselves as outsiders challenging establishment." He continues that "In 1964 a coalition of conservative activists seized control of the Republican National Convention and nominated Barry Goldwater for president." The Nixon presidency, writes Krugman, was a transition period rather than a triumph for the new conservatism. "It was during the Nixon years that the successful execution of dirty tricks became a passport to advancement in the Republican Party." In the 1980s came a big triumph for the new conservatives: the Reagan administration. "Supply-side" economics was championed by the new conservatives. This doctrine, writes Krugman, "claimed without evidence that tax cuts would pay for themselves," but it "never got any traction in the world of professional economic research." Krugman summarizes saying that "those of us who call ourselves liberal are, in an important sense, conservative, while those who call themselves conservative are for the most part deeply radical. Liberals want to restore the middle-class society I grew up in; those who call themselves conservative want to take us back to the Gilded Age, undoing a century of history."